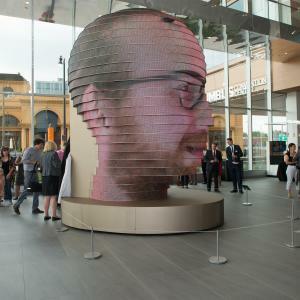 The piece is a 3-D universal human head made from ribbons of ultrabright LED screens and is equipped with a photo booth capable of taking 3-D pictures. Once the photos are taken, the portraits are then projected on the face of “As We Are.” The project is meant to portray the welcoming atmosphere and diverse culture in Columbus. The sculpture, fabricated by Design Communications Ltd., of Boston, was commissioned by the FCCFA, owners of the GCCC, as part of a $3.5 million investment in local art specifically for the recent modernization. “As We Are” is intentionally located in the new, two-level open atrium entrance at the north end of the center, which is steps away from the Short North Arts District. This creates a true sense-of-place for convention attendees, as they can enjoy more than 150 pieces of distinctly Columbus art within the facility, then seamlessly continue their experience into dozens of galleries and more than 100 restaurants, boutiques and entertainment options throughout the neighborhood.